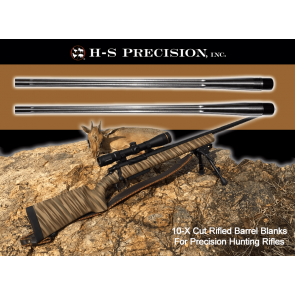 As the leading supplier and producer in the world of Ballistic Test barrels as well as the very accurate Pro Series of hunting, target and tactical rifles, H-S Precision knows what it takes to produce a quality barrel. All barrel blanks are 416R Stainless Steel and feature proprietary 6-groove 10-X cut rifling process. Blanks are offered in multiple contours, from a lightweight sporter configuration to a large straight taper, and everything in between. Any common twist rate is available in any contour. They are available in both fluted or non-fluted configurations. Choose from a lightweight hunting profile all the way up to a heavy tactical profile. These barrels are blanks and will need to be threaded, crowned, and chambered to your specifications. See the full description below for contour specifications.